It was during this election week of early November 150 years ago in 1863 that Pennsylvania Governor Andrew Gregg Curtin was re-elected. He was the most prominent of the Northern governors during the Civil War, serving from 1861-1867. 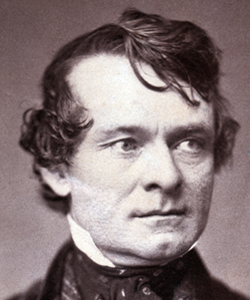 A graduate of Dickinson College in 1837, he was a lawyer who became involved in politics with the Whig Party … then the Republicans in 1860 … and finally as a Democrat in later life. There was some consideration of him as a running mate for Grant in 1868, and he would serve as the Minister to Russia from 1869-72. Under his gubernatorial administration, the Pennsylvania Reserves were mustered into combat units. In a Harrisburg agricultural school (near the Farm Show Arena today), in excess of 300,000 men learned the skills of war over the four-year period. It was called Camp Curtin. Curtin was a close friend of Lincoln – corresponding often and visiting in Washington to discuss War matters. But perhaps Curtin’s best moment of leadership came at a critical time of the War. In the wake of McClellan’s failed summer of 1862 Peninsula Campaign, along with the loss of the Second Battle of Bull Run at the end of August, the Union cause looked rather bleak. On the 6th of September, Curtin sent letters to invite all Northern governors to a secretive meeting in Altoona, PA to discuss how to better support Lincoln and the War effort. Called the Loyal War Governors’ Conference, they met from the 24th to 26th of September. Though they could not agree on all matters, and though some particularly wanted the head of McClellan on a platter, they ultimately agreed on the support of the continued War effort and the call for raising an additional 100,000 men. Of course, between the time the meeting was called and when it convened, the Union was able to claim Antietam as a victory. Additionally, Lincoln had announced the Preliminary Emancipation Proclamation on the 22nd – changing the War from merely the preservation of Union and giving it a moral purpose … while freezing Europe from aiding the Southern cause. Click HERE to read an excellent short article on this meeting. Posted by Randy Buchman on November 9, 2013 in Antietam Aftermath Series, General Civil War Themes, Sesquicentennial Series and tagged Camp Curtin, Governor Curtin, Loyal War Governors' Conference.